The Crossflow utilizes a side to side coolant flow pattern. The OEM and most aftermarket radiators have a downflow top and bottom tank configuration. The primary advantage of a crossflow is the longer transverse coolant path allows more time to shed heat. Placing the filler on the low pressure side also prevents the cap from releasing pressure prematurely as it can in traditional top/bottm tank designs. The core also features carefully optimzed fin density and thickness to allow the maximum cooling in the most compact and lightweight radiator. This lightweight 31mm core will cool more efficiently than the Koyo 55mm we also offer. Starting with a clean sheet of paper, we were able to include the features of the best radiators on the market and add a few of our own. -Two drain plugs. Each drain plug is a common 10x1.5 bolt with a simple o-ring. Lose a plug? 10 minutes at your local auto parts or hardware store and you are back in business. -High flow fill neck. Nothing more anoying that bleeding a cooling system that has a tiny filler neck that requires a funnel and slo-mo filling. -High pressure 1.4 bar (20psi), high temp cap. The standard cap with our radiator will allow your system to operate at 25% higher system pressure. That raises the boiling point even further. The seal is high temp silicone, not rubber that will crack and leak. -Convertible. 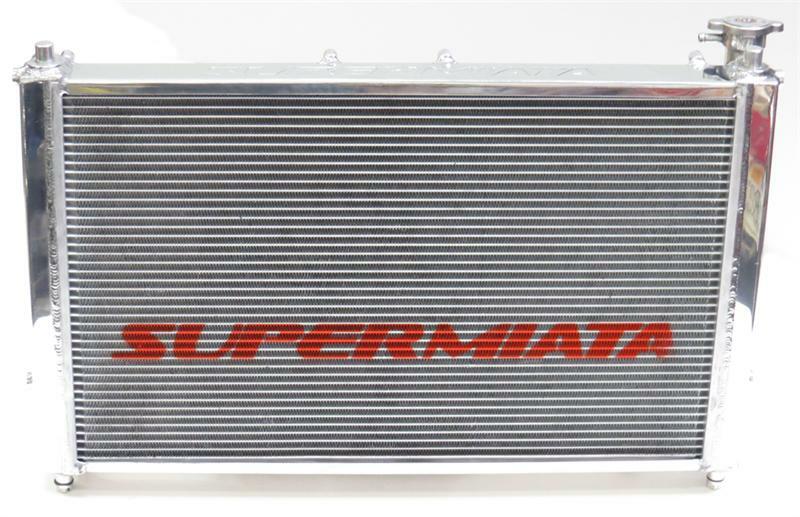 Our radiator will fit any year 89-05 MX5 Miata with included hardware.